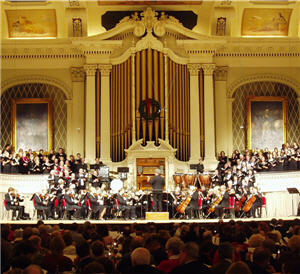 This weekend my husband and I are going to the Holiday Pops Concert this weekend at Worcester’s renowned Mechanics Hall. This will be my first time so I am very excited not only to attend the concert but to visit Mechanics Hall. There is something about old, classical buildings that have always attracted me. It is also said to be one of the top concert halls in North America. The Worcester Holiday Pops Concert is similar to many Holiday Pops concerts around the country. It features many traditional Holiday song favorites as well as popular Broadway songs as well. We will also have the pleasure of listening to the combined choruses of 5 local colleges, which will include Anna Maria College, Assumption College, Clark University, Worcester State College and Worcester Polytechnic Institute. Though we are leaving the kids at home for a change the Holiday Pops Concert is a good family event to celebrate the Holiday Season. Seating is available both on floor tables as well as the balcony. Today December 9th is the last day you can order tickets online. This is also a great reason to get into the city and dine at one of the local restaurants before the show. We will also be trying out the People’s Kitchen of the Citizen down the street from Mechanics Hall. The concert itself takes place Saturday night December 11th 2010 at 8pm. Hope to see you there! Happy Holidays from the DirectoryofWorcester.com!